How to replace the filter bar cell text as empty instead of “(All)”? In GridGroupingControl, filter bar cell text is “(All)” by default as in the following screenshot. To replace the filter bar cell text as empty instead of “(All)”, you can use the TableControlDrawCellDisplayText event. 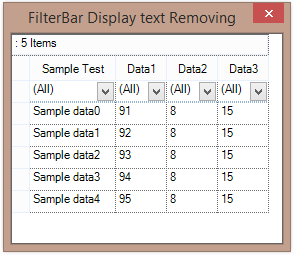 The following code example is used to set filter bar text as Empty.